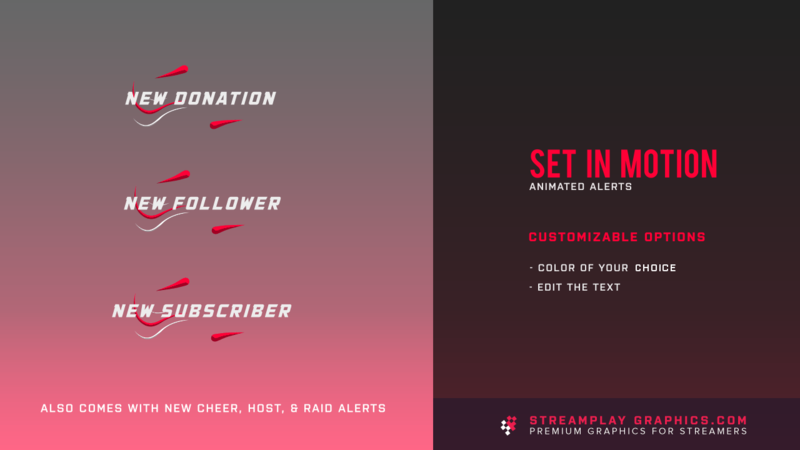 Our Set In Motion animated Twitch alerts were designed to give your stream a unique look whenever you get a new viewer interaction. The animation isn’t over the top, but still has a cool effect that’ll create a more professional look for your channel. 1. Download Default Alerts – If you don’t need any customizations (color/text), then this is the option for you. With this option you’ll be able to instantly download all 6 alert animations that will look exactly like preview video above. 2. We Edit For You – If you’d like the colors and/or text customized, then you’ll want to choose this option. With this option you’ll be able to let us know what edits you’d like made, then we’ll personally make those customizations for you then send your alerts to you via email once complete. These animated alerts come as WebM file types, meaning they will work perfectly with your favorite streaming apps like Streamlabs, StreamElements, and Muxy. 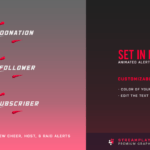 Want These Animated Alerts For Your Stream? Choose your purchase option below, then click Add To Cart to have these alerts ready for your next stream!